Painting My World: Don't Miss this Opportunity for a Free Workshop! Don't Miss this Opportunity for a Free Workshop! It is in your hands. There isn't just one simple answer to becoming a better pastel artist. But there is actually a simple way to make great progress. It is called IAPS. If you aren't familiar with IAPS let me introduce you. I owe much of my growth as a pastelist to this wonderful group. 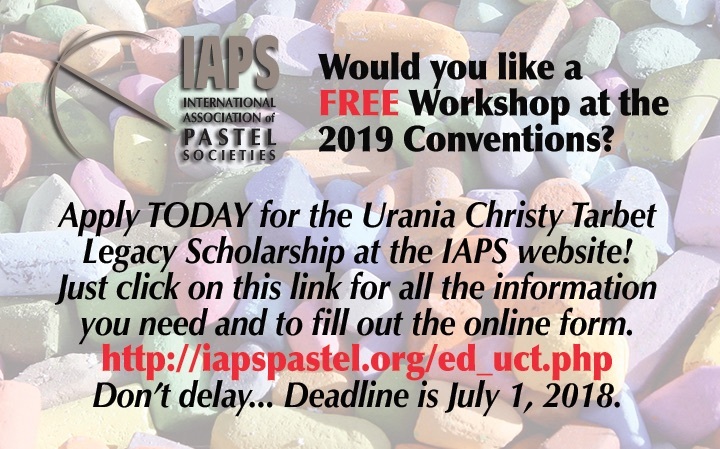 IAPS stands for International Association of Pastel Societies and it is a non-profit organization uniting pastel societies worldwide. IAPS holds exhibitions and a fantastic biennial convention all designed to promote the luminous medium of pastel. The IAPS biennial convention is the secret to becoming a better pastel artist and it is almost time to register for the next convention to be held June 4-9, 2019 in Albuquerque New Mexico. Attending the convention has so many benefits and I will be sharing them in upcoming posts....but the most important thing it did for me was to introduce me to my Pastel Family. That's right! Did you know you had a pastel family? Family support and help is so important for our success in any endeavor. Being an artist can often be a lonely journey. Many of us have art friends but few of us are fortunate enough to live in an area with many pastel friends. We are often on our own when it comes to pastels and learning how to improve. When you attend an IAPS convention you will be among your pastel 'peeps' . We take over the Hotel Albuquerque and the rooms and halls are filled with everything pastel for the week. Take classes and workshops, attend demos and seminars all from the best instructors. Shop for the latest pastel supplies in the candy shop, trade tips and share with other artists from around the world. Everyone at the convention shares your passion for pastels. The effect this experience can have on your growth is huge!